I should have gotten this sooner, but what can I say. I don't use footnotes in my fiction. Anyone guess our photo section bibliophile? It was William Ewart Gladstone. He was the Victorian prime minister who would walk the streets of London seeking out prostitutes to rescue and rehabilitate. Quite unseemly behavior for a politician--the walking on the streets part, I mean--but I, for one, believe Gladstone did not actually cavort with the prostitutes he claimed to help. I'm not sure he helped them, either, but his protestations of sexual innocence ring true. Oh, right, and he collected books. 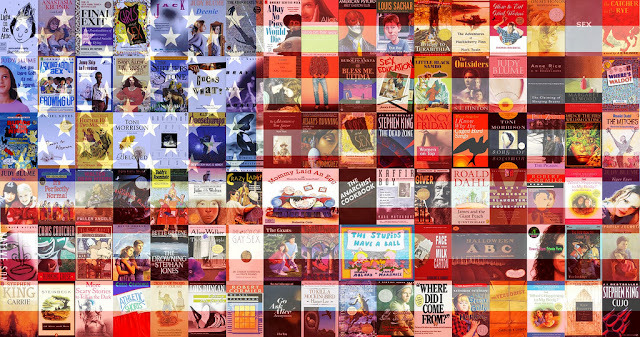 You can click through to the Flickr page and see if you can identify all the books. One's missing--they used the top 100 books banned between 1990 and 2000--but it wasn't a title I recognized. Seriously, some of these books are REALLY BENIGN. Wow, makes you wonder.